Even though it happened hundreds of years before, Sicily is still marked by the scars of the emergence of the Fae on Mount Etna. Flooding through the countryside, razing cities, and leaving nothing behind, they fundamentally changed the growth of the island. Although the Byzantines - and later the rulers from Muslim Africa - were able to rebuild a deep distrust of everything faerie was left behind. 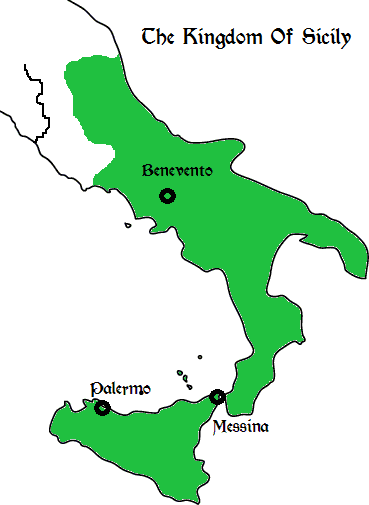 During the Norman expansion in the 11th Century, while the rest of southern Italy was slowly being conquered, Roger Bosso (later Roger I) turned his eyes to the Emirate of Sicily. Early on the campaign seemed to be doomed, with Bosso's early armies being facing grave resistance, and desperate misfortunes - his armies were forced more than once to flee camps infested with tarantulas. However, over the course of 30 years Roger brought the entirety of the islands of Sicily and Malta under Norman control. Then, on Christmas Day 1130, the Kingdom of Sicily was formed - independent of Norman control - under the first King of Sicily, Roger II. Despite some initial skirmishes with the Holy Roman Empire, the Kingdom has remained mostly stable until the present day. Now the current King, William II, lies on his deathbed without heirs and Sicily turns out towards the wider world. Due to its position between Europe and Africa, and its previous status as the Emirate of Sicily, the Kingdom of Sicily stands alone in the world as being a melting pot of different cultures brought together in peace and relative equality. Arabic culture is still strong in the Kingdom with contributions to everything from architecture to law obvious throughout (many of the inhabitants speak Arabic in addition to their native tongue) and there are significant populations of Byzantine Greeks, Lombards, Jews and Native Sicilians living under a Roman Catholic Norman ruling class without great strain. Whether this is envious or pitiful depends greatly on who you ask, and the Kingdom is glorified and vilified in equal measure. Cultural power in Sicily is highly centralised in the capital city of Palermo, the largest city in Europe and the Mediterranean and one of the great cities of the age. Through the Assizes of Ariano, laws made by Roger II in 1140, almost all official and legal powers were brought directly under the King, who had no power above him. All citizens were recognised as equal under the law, though Christian heretics were heavily punished throughout the realm. Finally the knightly orders were closed off to those of common birth, as Roger II hoped to guarantee power in the Kingdom for his kin and those close to them. The natural riches of the island and novel agricultural techniques introduced by Fatimid Caliphate has allowed Sicily to become rich off the export of food, and other valuable natural resources. Ask any merchant who has spent a good couple of years away from their home, and they will have stories to tell you of the rare and sometimes magical riches that are hidden deep within Sicily's hills. Due to the easy access to both mainland Europe and the Islamic and Arabic dynasties of Africa, Sicily acts as a hub for trading between the two, especially due to historic tensions in both the East and the West. This is all cemented by Sicily’s place as the dominant maritime power in the Mediterranean fending off even the might of the Byzantine Empire at times. As a result of these, the Sicilian navy is often position close to home, as a collapse of the Kingdom's trade ports will undoubtedly wreak havoc as far away as even England. King William II – “The Good”: Following his father William I’s tumultuous reign of holding out against baronial rebellions, the reign of the current King has been consistently peaceful since the end of his regency in 1172. However the good King’s health now wanes, and with no heirs to succeed him the future of the Kingdom looks unsecure. Salvatore di Napoli: The Sicilian ambassador to the Norman courts of England. Previous to his appointment to England he had been the admiral of Sicily’s fleet, and his steely devotion to his kingdom has not waned during his time abroad. Joan of Capua: A heretic who is often seen preaching on the mainland realms of the Kingdom. From the brands one can easily tell that she has spent much time under the generous legal graces of the King. Aisha al-Khudri: One of the King’s Viziers who is responsible overseeing the province of Benevento during the King’s poor health. Quiet, and slow to judge, she is nonetheless very trusted by the King and the court in Palermo. Starting as a political and religious rebellion against the Almoravids - the previous rulers of this portion of Western Africa - they quickly grew from a commune in the High Atlas mountains to an empire spanning the entire West African coast of the Mediterranean and spreading up even into Spain. 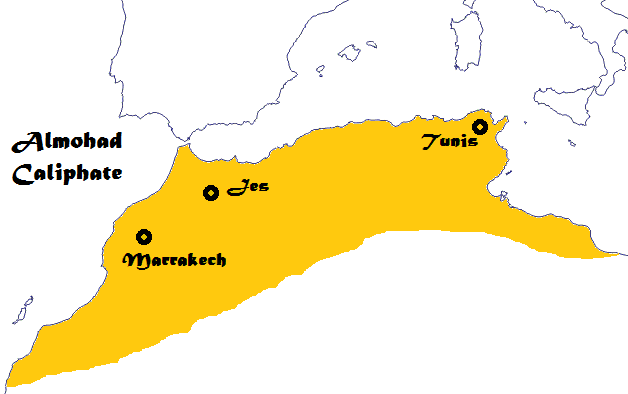 Although the leader of the initial revolt, Ibn Tumart, died in 1130 after failing to take Marrakech the rebellion took on a life without him and were able to seize large parts of Africa, as well as Al-Andalus in Spain. Now ruled by Ghaliya el-Amin, the Almohads are having to look inwards as they begin to face the same threat as their predecessors: revolution. While the Mahgreb region is very Arabised, due to centuries of Arabic conquest and conversion to Islam, it is primarily inhabited by the Berber people. The people live either as nomads, or in small cities, tending for livestock to keep themselves and the rest of their clan fed. Music and arts are tightly interwoven with the daily lives of the tribal people here, and it is not unusual to see wandering bands of professional musicians roaming from settlement to settlement. It is this tribal structure that allowed the Almohad rebellion to push on after Ibn Tumart's death, as he had tied his family close around the political leadership, so they could continue after him. A very puritanical approach to the law was part and parcel to the changes that fueled the Almohad rebellion, and as such people under the Almohads have both the security and restriction of a peerless system of laws. The school at al-Qarawiyyin in Fes serves as the capital of law, just as Marrakech serves as the political capital, and is responsible for an ongoing exchange of information with the Arabs to the East. This system has been used to maintain the current rule, and those who have escaped from the borders of Almohad land report that those who have not submitted to Ghaliya's rule are under a terrible yoke. Ghaliya el-Amin: The current Almohad Caliph; though not as expansionist, nor as famous brutal as her predecessors, Ghaliya el-Amin is still a name that causes gritted teeth throughout the Mediterranean. Trade has not slowed either in or out of Almohad lands, but the recent spate of merchants abandoning - or absconding with - their wares and disappearing into the North or the East may be a dark sign of el-Amin's future plans. Talibah Fahmi: In charge of the school at al-Qarawiyyin, and the utmost legal authority under Almohad rule. Not much information about her has reached the ears of those in the West, but one need only look at what has been heard about Almohad laws to make educated guesses. Amydaz Karim: As an Amydaz - or poet - Karim leads a small troupe of professional musicians to play throughout Almohad lands and is often seen in Aragon, or even as far North as Southern France. The Ayyubid Dynasty stormed to power in 1174 ousting the Fatimids from Egypt and proclaiming the former Fatimid Vizier, Saladin, as Sultan. A keen and charming ruler, Saladin lead his forces to conquer Africa and a significant portion of the Arabic world in about a decade; rapidly securing dominance in lands from Nubia to Yemen. Yet in his wake Saladin brought commerce and infrastructure to the lands under Ayyubid rule as he sought to sustain and develop his war effort. As his expansion pushed ever closer to Baghdad - the seat of power of the his nominal suzerain, the Abbasids - Saladin drew a disparate net of petty Sultans and family members together to secure his power against those who could still merely strip him of all he has gained. Now that they hold Jerusalem the Ayyubids are being drawn into conflict with both Europe and the waning Abbasids - who have begun to move against the family of Saladin. Ayyubid culture as an idea only exists in the ruling class, the ordinary people in Ayyubid lands are relatively indifferent to the whims of Saladin and his ilk. In comparison to the local Kurdish or Turkish population the Ayyubid household is very Arabised, and it is the household that holds political control. It is not defined by blood relation but more by political and personal affinity, so paramours or even slaves could rapidly achieve great power within it. The infighting and bickering of the household is unrivaled throughout the known world, and makes even the most tentative and ephemeral alliances in England or France look stable. With their dominion of Yemen, the Ayyubids have taken control of almost all trade in Red Sea: putting them at odds with the economic powerhouse of Venice as well. As part of their expansion, the petty Sultans of Ayyubid territory began a regime of implementing new taxation, public construction, and military training. As well as attaching trustworthy allies to each region, and making use of the natural resources, there has been a great need for more mercenary talent from Europe and beyond to help push this explosive development. As each drop of growth gets taken up by the Ayyubid machine, the hunger for more territory, more money, and better armies gets ever stronger. There is a place for everyone willing to swear loyalty to Saladin in his armies, increasingly drawn from not just the esteemed and well-connected, but the low and local people of the territories now under Saladin's rule. Salah al-Din Yusuf ibn Ayyub: Sultan of Egypt and near sole engineer of the Ayyubid conquests, tales of Saladin's political shrewdness and military genius have only gotten brighter and more vivid as they have crossed through Europe. It is said that he is most at home in the sword dance of Arabic politics, and has drawn those close to him in a tight net, such that only those with the quickest wits and quicker tongues can get close to him. Sitt Al-Sham ibn Ayyub: As the younger sister of the Sultan, few can claim such easy access to power with so few fetters: her name is known throughout those educated in the lands to the East of the Mediterranean as a great patron of education, discovery, and religion. Those who can attest to her personally are hard to come by, though, as she rarely leaves the company of the inner circles of Saladin's court and acts mostly through intermediaries. Abd Al-Malik: Commander of Saladin's armies when the Sultan can not be at the front, or when the might of the Dynasty is pushed in two directions simultaneously. They wear their previous state as a servant in the household of the Ayyubids as a badge of pride, proclaiming that they have been seen worthy to be lifted up to stand alongside the Sultan. Their skill on the battlefield is only matched - if rumours are to be believed - by the shortness of their temper. Byzantines history is as proud as it is long. Since the destruction of the Western Empire it has been the pride of the Byzantines to keep the flame of Roman civilisation alight; and despite half a millennium of vicious wars, rebellions and internecine struggles, that is precisely what they have accomplished. Still, that light waxes as it has done since the sack of Rome itself. From the North the Empire is threatened by the newly independent Bulgars; From the West come marauding crusaders, as willing to sack Constantinople for food and gold as defend it; and from the East looms the ever present menace of the Seljuk Sultanate, whose lands have expanded into the Byzantines with slow surety, and whose armies have come knocking on the gates of Constantinople more than once. In this climate of uncertainty the new ruler, Isaac Angelos II, prepares for war. Taxes are raised, soldiers levied, Greek fire brewed in vast vats. In the wine sinks and docks of Constantinople, there is talk of stranger preparations still; of fires at night in the vacated Palatium Magnum and of covered caravans led into the city under the light of the moon. Byzantine Society is centred around the Grand city of Constantinople. A metropolis without equal, the city remains a cosmopolitan hub of commerce, religion, art and administration. At present Constaninople enjoys strong central governance, profitable trade with the Italian city states and crusader kingdoms and strong walls. However although the city itself has remained secure, its domains have always been disturbingly fluid. Byzantine culture at the level of nobility involves constant jostling for position within the administrative structure, often between “civic” and “military” nobility. This is further complicated by advanced systems of status and precedence within the court. Although the power of the Emperor is supposedly absolute, the machinations of court and kin have cut short the reign of many. The most common (and the official) language of the Empire is Greek, although nobles use Latin in the court, traders will know Arabic or Italian and those hailing from the Eastern provinces typically know some Syriac and Aramaic. The might of the Byzantine army stems primarily from the Cataphracts, armoured cavalry whose bodies and horses are covered in twin layers of padded scale mail. The common weapons of these warriors are the bow and the lance. Their tactics are to charge the enemy in a wedge of steel and flesh; their front ranks loosing arrows to break their foes formation before the rest impacted with raised lances. Infantry usually fill a supporting role to these elite warriors; however the Varangian guard are not usual men. These experienced warriors serve as the bodyguard of the Emperor, deployed into the battle only in the most desperate and crucial moments. At first recruited from Norsemen and Kievan Rus for their traditions of martial glory and oath-bound service, the guard is increasingly dominated by Anglo-Saxons; often men (or the ancestors of men) displaced of masters or land by the Norman Invasion. With Isaac Angelos II preparing for war, representatives have been sent to England to recruit more such warriors. Byzantium has acted as the centre of the Eastern Orthodox religion since the schism of 1054. The Ecumenical Patriarch of Constantinople stands as first amongst equals, leader of the Orthodox church in defiance of the Popes dictates. The religious differences between East and West have proven a wellspring of violence and mistrust; in 1182 the entire Latin population of Constantinople was slaughtered by followers of the Orthodox church, in 1185 a Norman expedition sacked Thessalonica and both Frederick Barbarossa and Henry VI have threatened to do so to Constantinople since. But the threat of religious violence is not enough to dissuade Western merchants from their trade in the city, least of all the Venetians - who possess several factories on the Golden Horn.